The laziest of all my lazy days! I literally just wore this dress, grabbed whatever accessories I saw and was out the door. I didn’t even bother combing my hair. Actually, I couldn’t find my comb! I have this little comb (Goody of course) that I carry in my bag because I always forget combing my hair before heading out, and the one day that I decide to use it, it decides to walk out on me and never return again. That’s the tale of my tragic hair. Just sharing haha! Here I go again with my randomness. I really will forever be “Camille Tries To Blog”. Oh, the things I write in these entries! So anyway, back to regular programming, before I got sidetracked and distracted by the tale of my tragic hair. I feel like such a lost little girl in this velvet dress. 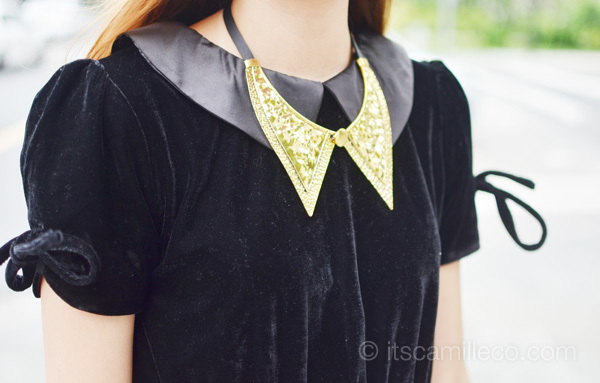 Since it’s collar is in black leatherette, I decided to add a metal collar necklace on top of it to add a pop of color–just a small attempt to lessen the laziness of the laziest of my lazy outfits. And since I’m already in a lazy outfit anyway, I might as well go all out on comfort. Jelly/plastic shoes are one of the most comfortable types of footwear out there. These are from Brazilian brand, Terra & Agua. I love that they have little red studs on them. They go perfectly well with my red and gold accessories! i ♥ you, camille co.. you are also my fashion icon. Also, for being friendly unlike any other blogger. Hey, Camille! You are my new fashion role model now! You are so pretty and tall! How tall are you? Thanks Kira! As a kid, I used to sleep really early and drink lots of milk. I don’t know any tips for grown women though haha! Thanks for telling me! I love milk! :P I am 15 years old going to be be 15 in October. I love the color of your hair. It matches you so much! Also i like how you would answer your fans questions and interact with them. Thanks Kira! You’re still so young! Yes I am. I am going to college next year, but I don’t know which college to go to. Also I don’t know what I am to be in the future. I think you have an awesome as being a designer and a model. How old are you? I hope so. Thanks for your advice! You look way younger than 24. You look like you are 19. Did you went to college before starting your career? Did you get discovered? Do you know the cartoon series namely “The Adams Family” especially Wednesday because seeing your dress reminds me what she wore in the show hehe. Kulang na lang pigtails at black hair hehehe. Wow I love your dress!!! <3 So pretty on you! amazing! you make jelly shoes look classy! on other people they just look tacky! Thanks so much Charisse! :) I’ll continue my randomness then! We are scheduled to visit HongKong for the first time this coming weekend and I was wondering where particularly in HK do you shop so we can maximize our shopping spree there. your hair still looks good! :) And I love that dress! Super cute!!! May I ask what Lipstick are you wearing in this outfit? I love this post . Is this dress vintage because it looks like it is. Anyways, you brought jellys back into style. Seriously?! Lazy dress?! Still a head turner and prim and proper. Most people I know would see this as already all made up. Awww you’re too nice! Thanks Mark! What a beaut. My regular lazy day outfit would be jeans and baggy shirt, hiding all my curves. Teehee. you don’t look lazy at all. HAHA. you look like “Ang ganda ko lang. I don’t care about my hair” HAHAHAHA. pretty all the time! Hey Camille! I actually love reading all the randomness that you write in your posts. It makes your readers feel na you are “normal” (Idk what word to use eh, but this is a compliment!) naman and not all/mostly concerned with fashion and beauty alone but like how you describe in your side rail, “…few other loves in between.” :) So keep it up! If retail brands have their, USP or unique selling point, then that’s your UBP (unique blogging point) HAHA. “Not Combing THE HAIR” — I might wanna try this some time.. lol XD.. BTW, the flats are beautiful. I’ve always wanted to wear flats but I’m only 5’2 so duuh forget it. love it!! beautiful as always !! hi camille! what’s the size of your feet? i have all my shoes in size 8 and there’s this one pair na ganyan un style un patusok effect haha! and it makes my feet longer. looks like im wearing flippers lol. how can u manage wearing shoes like that? Awwww thank you! Time to insert advertisement: “All because of the world’s best, Pantene.” Hahaha! Ahh! Let me youtube that song! :) Thanks Emma! is this the same shade of lipstick you wore at Bloggers united and what brand is it? I was staring the whole time. haha! Haha! Thanks Edz! This one is different. It’s from Topshop, Ohh lala. Yes! Browse through my old posts :) Keds! What lipstick were you using in these photos? Delicious! Growth spurt! Haha! Thanks Jayr! I’m really mabait and innocent haha! I’d like to know more on the Tale of Your Tragic Hair. Haha. Kidding. I wish I could wear velvet as good as you do. Yay! Someone’s interested in my tragic hair! Haha! It’s simple and still very nice =)) I love the dress! Velvet? You’re too nice! Thanks Stef! we send u an email for sponsor kindly check. You’re so tall. I’M ONLY 5’5. hOW i WISH I have your height! You always look beautiful Camille, i love the dress. Wish i could look that great when im lazy!! !